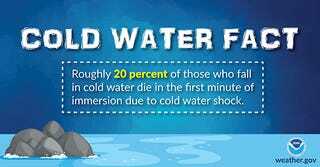 Please remember that in springtime, the water can be extremely cold, even if the air temperature is not. Always wear your PFD and don’t get in/go out on the water unless you are dressed for the cold, as cold shock can be fatal. Yes, wetsuits and drysuits are dorky and uncomfortable, but its better to look ridiculous than to be dead. Was out walking with kids the other day, and thought the local FD was practicing rescues at the lake. Heard today that a 28-year old had gone into the water to chase after a dog that had jumped in the water (it was over 80 here that day). The dog was fine, but his owner did not survive, succumbing to cold shock. If someone needs rescued and you don’t have the equipment to assist, call 911, and use branches/ropes etc. to assist. If a person falls in, and survives the initial cold shock, you have a few minutes even in very cold water (and much more - hours - if they are wearing a PFD) where the person will be ok - just keep them calm and don’t become the second victim.